To see how all of this works, let's consider the example of a client and server using a mythical file retrieval protocol. 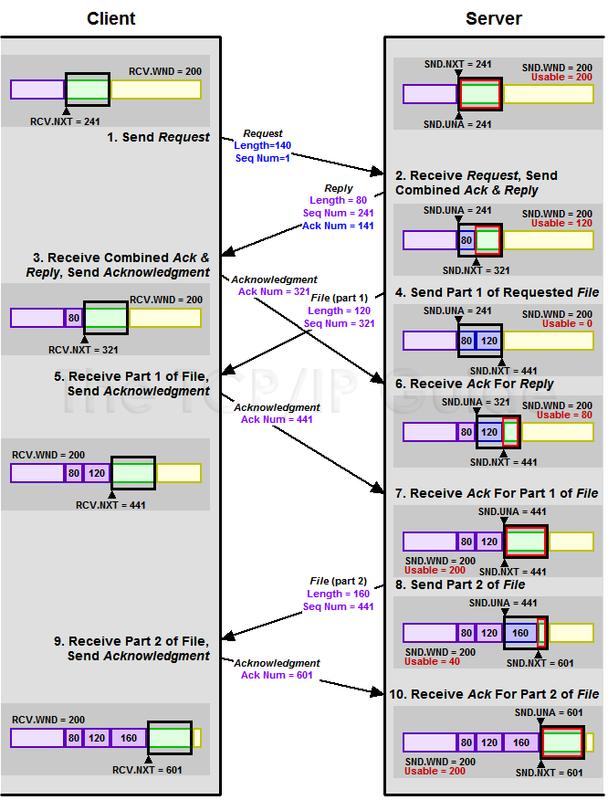 This protocol specifies that the client sends a request and receives an immediate response from the server. The server then sends the file requested when it is ready. During connection establishment, the client sets up its pointers based on the parameters exchanged during setup. Notice that the SND.UNA and SND.NXT values are the same  no data has been sent yet so nothing is unacknowledged. RCV.NXT is the value of the first byte of data expected from the server. The server sets up its pointers just as the client does. Notice how its values are the complement of the client's. The client transmits a request to the server. Let's say the request is 140 bytes in length. It will form a segment with a data field of this length and transmit it with the Sequence Number set to 1, the sequence number of the first byte. Once this data has been sent, the client's SND.NXT pointer will be incremented to the value 141 to indicate this is the next data to be sent to the server. The server does nothing, waiting for a request. At this point the client hasn't received an acknowledgment for its request. At present, SND.UNA+SND.WND is 361, while SND.NXT is 141. This means the current usable window is 220 bytes. The the client could send up to 220 more bytes of data before getting back an acknowledgment. For now, let's say it has nothing more to transmit. The server receives the 140-byte request from the client. The server sends back an 80-byte response that also acknowledges the client's TCP segment. The Sequence Number field will be 241, the first sequence number of the server's 80 bytes of data. The Acknowledgment Number will be 141, telling the client that is the next sequence number the server expects to hear, and thereby implicitly acknowledging receipt of bytes 1 through 140. The server increases its RCV.NXT pointer to 141 to reflect the 140 bytes of data received. It increases its SND.NXT pointer by 80. The client receives the server's response. It sees the Acknowledgment Number of 141 and knows bytes 1 to 140 were successfully received. It increases its SND.UNA to 141, effectively sliding the send window by 140. The client also accepts the 80 bytes of data the server sent, increasing its RCV.NXT pointer by 80. Assuming it has no more data to sent, it sends back a TCP segment that is a pure acknowledgment of the server's response. This segment has no data, and an Acknowledgment Number value of 321. While the client was receiving its response, the server's TCP was supplied with a 280 byte file to be sent to the client. It cannot send this all in one segment however. The current value of SND.UNA+SND.WND is 441, while SND.NXT is 321. Thus, the server's usable window contains 120 bytes of data. It creates a TCP segment with this much data and a Sequence Number of 321. It increases the SND.NXT pointer to 441. The server has now filled the send window. Note that the server does not have to wait for an acknowledgement to the reply it sent in step #2. This is a key factor in TCPs ability to ensure high throughput. The client receives the first 120-byte part of the file the server was sending. It increases the RCV.NXT pointer to 441 and sends an acknowledgment back with an Acknowledgment Number of 441. Again, if it had another request to make of the server it could include it here, but we'll assume it does not. 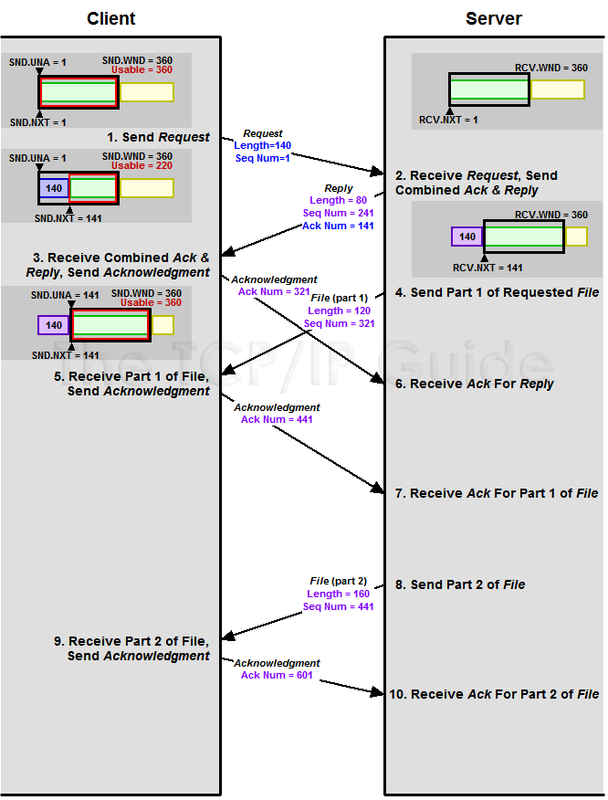 The server receives the client's acknowledgment of its earlier 80-byte response (sent in step #2). It increases its SND.UNA to 321. Since it just received acknowledgment of 80 bytes (and the client's window didn't change), the server's usable window is now 80 bytes. However, as we will see in the section on TCP performance, sending small segments like this can lead to performance issues. Let's say the server has been programmed to not send segments under 100 bytes when it has a lot of data to transmit. It decides to wait. The client waits for the rest of the file. The server receives the acknowledgment for the first part of the file. It increases SND.UNA to 441. This now restores the full 200 byte window. The client continues to wait for the rest of the file. The server sends the remaining 160 bytes of data in the file in one segment. It increases SND.NXT by 160, and sends the data with a Sequence Number value of 441. The client receives the rest of the file and acknowledges it. It increases RCV.NXT to 601 and sends back a segment with an Acknowledgment Number of 601. The server is done for now; it waits for the acknowledgment of the second part of the file. The client is done with this exchange. The server receives the second acknowledgment and slides its send window forward by 160 bytes. The transaction is now completed. The transaction of Table 159 from the perspective of the server. See Figure 222 for the clients pointers. The transaction of Table 159 from the perspective of the client. See Figure 221 for the servers pointers.